…well, our Street Team at least. 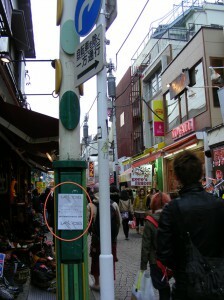 Check out our flyer campaign in the Harajuku neighborhood of Tokyo, Japan! This entry was posted on Monday, December 27th, 2010 at 4:49 pm	and is filed under blog. You can follow any responses to this entry through the RSS 2.0 feed. You can leave a response, or trackback from your own site. And I thought I was going to go to Japan to watch you!